Daniel Reeve photographed by Deddeda Stemler. Daniel Reeve teaches a college class where each day's lessons are ripped from the headlines. Or 140-character Twitter posts. Mr. Reeve has just completed a four-session, 10-hour lecture series on "The Rise of Barack Obama: From Humble Beginnings to the First 100 Days." The United States president is barely through a tenth of a first term in the Oval Office and he's already fodder for the classroom. The criminology and political science teacher included in each class a memorable Obama oration - his inauguration speech; his red-states, blue-states speech to the Democratic convention five years ago; his troubleshooting more-perfect-union speech on race relations; and the New Hampshire "Yes We Can" primary speech, soon after mashed into a music video by will.i.am. The best political orator in a generation offers stiff competition for a lecturer interested in holding a classroom's attention. "It's hard to follow him, let me tell ya," Mr. Reeve said. His solution: Throw it back to the class. Ask the students their reaction to a speech. Mr. Reeve considers Mr. Obama to be the most important politician in Canada since the retirement of Pierre Trudeau. He sees the charismatic president as a political game changer, as his march to the White House destroyed one myth (a negative message trumps a positive one) after another (the young don't vote). Mr. Obama is a phenomenon. "He gained in one year what politicians struggle for in their entire career," he said. Mr. Reeve, 38, who was born in Toronto and raised in British Columbia, has spent time on the hustings himself. He got thwacked as an NDP standard bearer (a.k.a. sacrificial lamb) in West Vancouver-Capilano in the 1996 provincial election. He has had better fortune as a campaign organizer, having helped elect Dean Fortin mayor of Victoria last fall. He also had a stint as a ministerial assistant to health minister Corky Evans, a populist whom he found to be "much smarter than anyone ever gave him credit." Mr. Reeve spent the past two years glued to his television, becoming best friends, he joked, with Anderson Cooper of CNN and Jon Stewart of The Daily Show. His Camosun College lectures included an examination of the unsuccessful Republican campaign, including one topic certain to stir the classroom. "As soon as you raised Sarah Palin," he said, "everyone got fired up." The Alaska governor and Republican vice-presidential nominee did not have admirers in the class. "In this class, in Victoria, in this context, everyone thought Sarah Palin was a joke." The teacher insists his lectures avoided becoming a "love-in," maintaining a rigorous academic standard, though he confesses that "Obama could walk on water in this town and no one would bat an eye." He anticipates reviving the lecture series this fall. Mr. Reeve sees parallels between Mr. Obama and one of his Democratic predecessors - one who, incidentally, also came to office at a time of economic uncertainty. The saviour of American-style capitalism was celebrated in his day with shelves full of souvenirs - buttons, badges, medals, hand fans, lucky coins, calendar pads, mantelpiece clocks celebrating him as the captain of the ship of state. To this day, Franklin D. Roosevelt product continues to slip off the presses - witness Conrad Black's epic doorstopper biography. The inauguration of the current president has been greeted with a similar outpouring of commemorative plates and plaques, not to mention other tchotchkes, as well as such ephemera as newspaper supplements. Nor is Mr. Reeve alone in studying a president yet to have time to create a legacy. 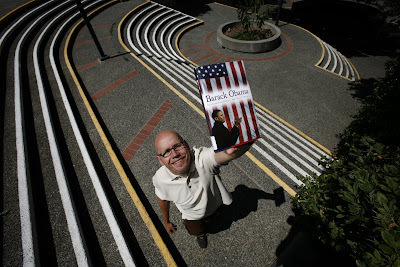 Last year, Andrew Wender taught a course at the University of Victoria called "Obama or McCain: American Presidential Politics, Canada and the World." The American-born professor's class attracted 160 students - about a third were members of the public who signed up through Continuing Studies. In a time of tough economics, Obama 101 is a growth industry. Since the global media cartel demands that all newspaper stories contain a reference to Michael Jackson, here's mine. Back in the 1960s, a British Columbia-based soul band called Bobby Taylor and the Vancouvers was signed to a recording contract by Berry Gordy, the mogul of Motown. The band included a guitarist from Edmonton named Tommy Chong, who would later team up with Cheech Marin as the stoned comedy duo Cheech & Chong. Mr. Chong co-wrote the band's first hit, a ballad about interracial love titled, "Does Your Mama Know About Me," which was covered by the Supremes. Bobby Taylor and the Vancouvers had a Top-30 hit with the number, driving sales of their eponymous debut album, the cover of which was photographed with Vancouver's futuristic Bayshore Hotel as a backdrop. In 1968, the Vancouver group was a headlining act in a 10-day revue show at the Regal theatre in Chicago. Among the supporting performers was a family act from nearby Gary, Ind. Mr. Taylor took one look at the dancing lead singer and saw in him a pint-sized James Brown. He called Mr. Gordy in Detroit and urged him to sign the family. Mr. Taylor then produced their Motown debut album. In Motown's mythmaking, the lead singer of the Supremes was credited with discovering the group, so the album was titled, Diana Ross Presents The Jackson 5.